Lunch can be one of my favourite meals of the day, but getting stuck in a sandwich rut can be so boring. While I was at work I would have the same sandwich every single day, not exactly an exciting varied diet. So when I headed off on maternity leave I made it my mission to make lunch time more interesting, not just for me but for Isabella too. I know we're in summer, but I'm more of a soup than salad fan so have been making a whole bunch of different soups. 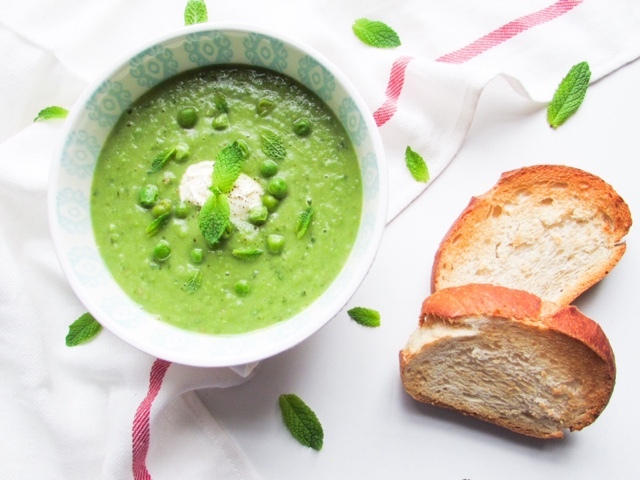 Pea and Mint is not only a classic, but also perfect for summer because it is refreshing and light. My version is nothing ground breaking, just a quick flavourful recipe that can be made in a big batch to freeze or enjoyed straight away. I made a big batch to pop in the freezer prior to giving birth, so I knew that Isabella and I had a healthy homemade lunch option for when little one arrived. 1) Spray the Frylight or pour olive oil into saucepan over a medium heat. Add the chopped onions and potatoes and cover. 2) Fry for 10-15 minutes, stirring every now and again. Add almost all of the mint, frozen peas, garlic, black pepper and crumble in the stock cube. Stir and cook for a further 5 minutes. 3) Pour over enough boiling water to just cover the vegetables and simmer until the potatoes and peas are cooked through. 4) To make your soup smooth you could either use a hand blender or pour it into a blender. I used a blender because then I could add water while blending to create the desired consistency. 5) Once blended you can serve straight away or add back to the pan to heat through. To serve add a dollop of thick double cream/crème fraiche and the rest of the fresh mint. What's your favourite homemade soup? This looks really delicious, I have to say its a flavour i would never choose or eat but it looks so lovely here that I could be tempted to try it. YUM! This is my favourite soup! I'm the only one who likes it in our house so I rarely make it but I'm going to try this for sure! This soup sounds and looks very tasty. My partner would love it. I'm not a big fan of peas but I think this sounds delicious. Glad you put garlic in it! Yummy, we like cold soups in the summer but would make the exception for a hot bowl of this! 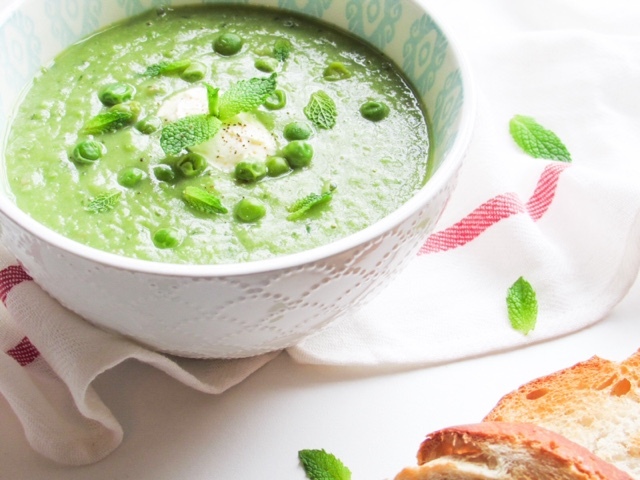 I love soup but am not keen on peas so I've pinned this to try later and see if you can convert me! I love how the ingredients list is kept to a minimum! Absolutely hate it when the list is too long and away too many ingredients! I JUST WANT SOUP LOL! 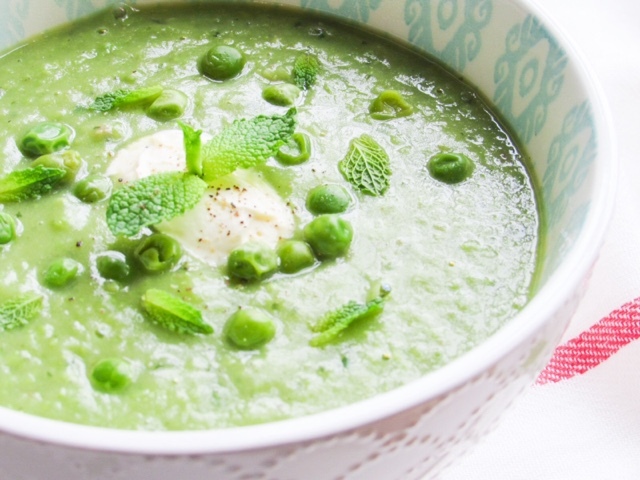 Love pea and mint soup though! 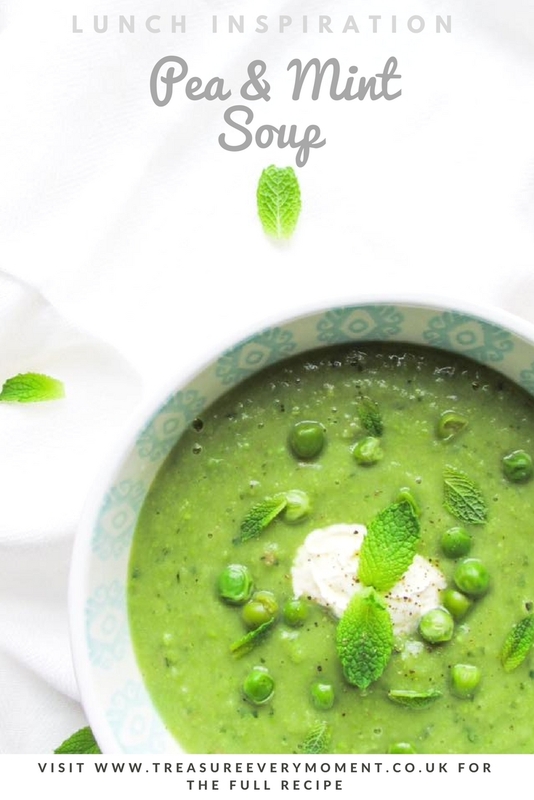 Ooh this looks delicious, I had pea, spinach and broccoli soup the other day which I had never tried before. So good! Surprisingly, we had pea, mint, and coriander soup for lunch today. This combo is always a winner. This looks amazing. Our favourite is butternut squash soup, but I'm sure we will try this.